Like every other room in the house, homeowners and buyers today are interested in bathrooms that provide comfort, functionality and style. 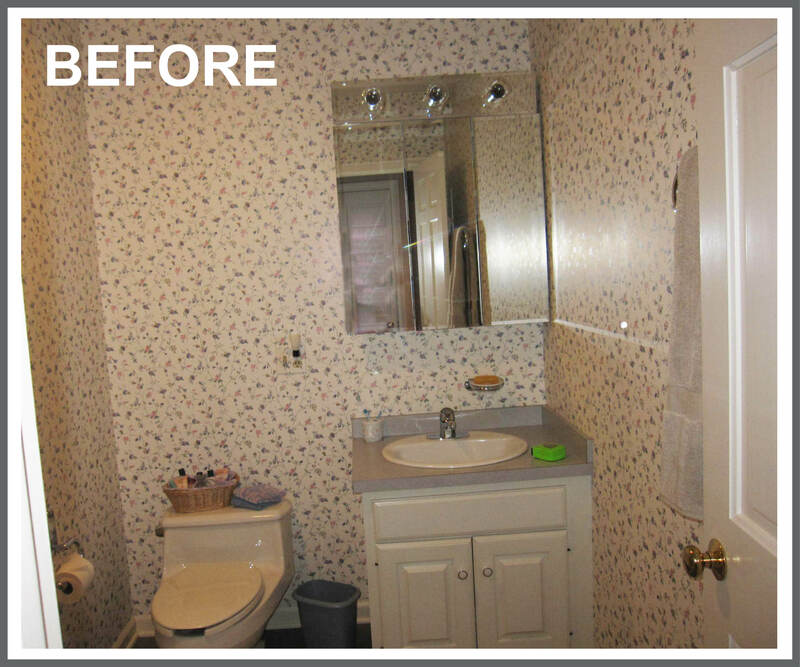 Whether you’re thinking of some basic upgrades or a full transformation for your outdated bathroom, we’re here to help! 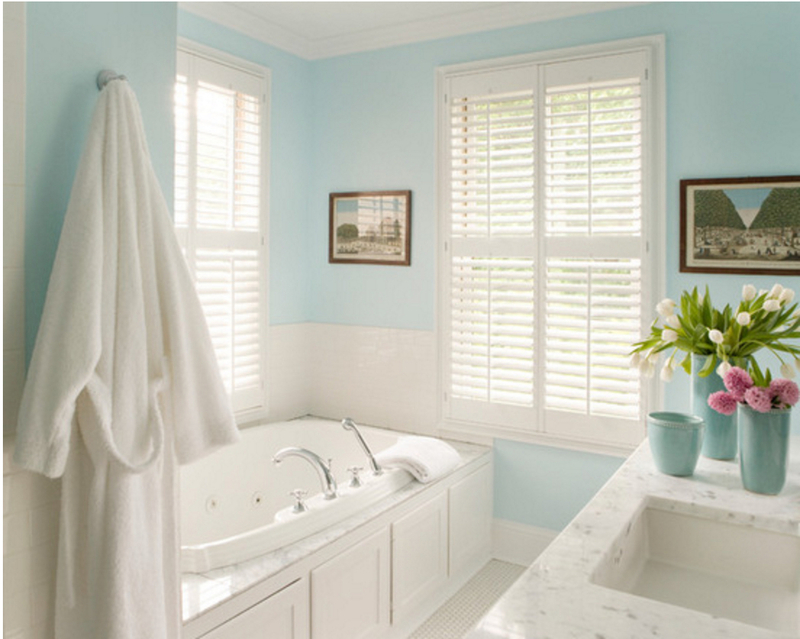 The following tips along with images we chose on Houzz.com feature some of the latest design trends that will provide pleasure now as well as increase value down the road when ready to sell. This popular shower style provides a sleek, contemporary look and is a safe option for all ages as well as easy to clean. Integrating a frameless door with tile surround on walls and floor can also make a small space feel larger. Permanent features such as tile, flooring and vanities in calm, neutral colors such as whites, grays or beiges are a perfect backdrop for modern, timeless appeal. Walls in soothing blue or green hues, brushed metal fixtures and splashes of bright accents will add a tranquil, spa-like ambience. Choose vanities and counter tops in a range of earthy materials such as wood, natural stone and river rock mixed with accessories such as natural woven baskets and rugs, plants and botanical artwork to add beautiful texture to your design. 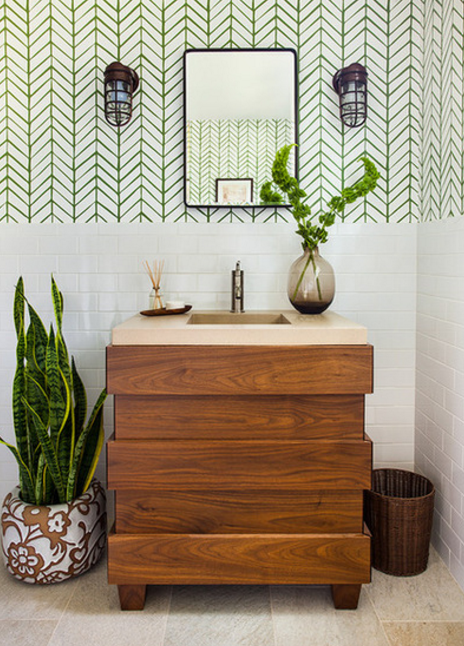 Geometric wallpaper prints (as shown above) are also hot now for adding a personal touch that can easily be removed later. 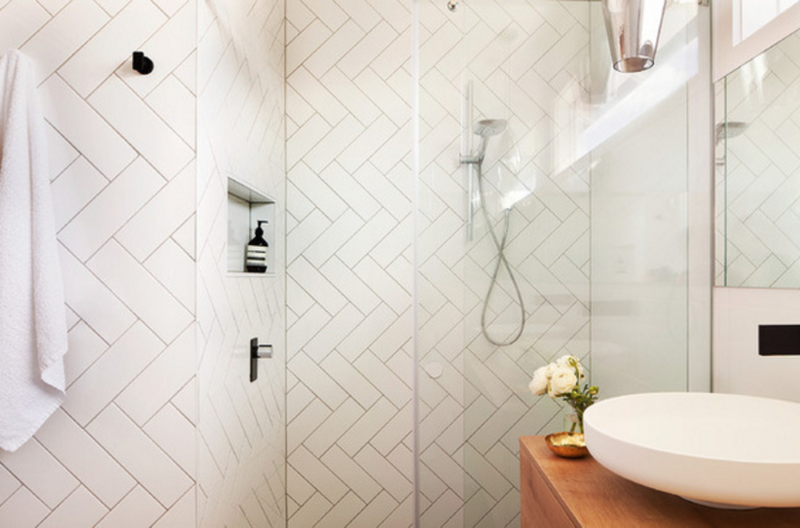 Tile continues to be in the spotlight but the emphasis is on using creative patterns (such as herringbone in photo above) as well as incorporating a mix of contrasting sizes and materials to give visual depth and a sophisticated look. Since bathrooms use the most amount of water in most homes, this is the room that is increasingly designed with eco-friendly features in mind. Fixtures such as single-hole, motion-activated faucets, dual-flush toilets and water efficient shower-heads all reduce water usage and will appeal to any buyer looking for a green, cost-effective home. in any home — from updating the style, increasing resale value, to adding functionality and more storage options. Whatever the reason, the following are some key factors when considering the scope of the project which will help when consulting with a design team or contractor, or simply making your own improvements. 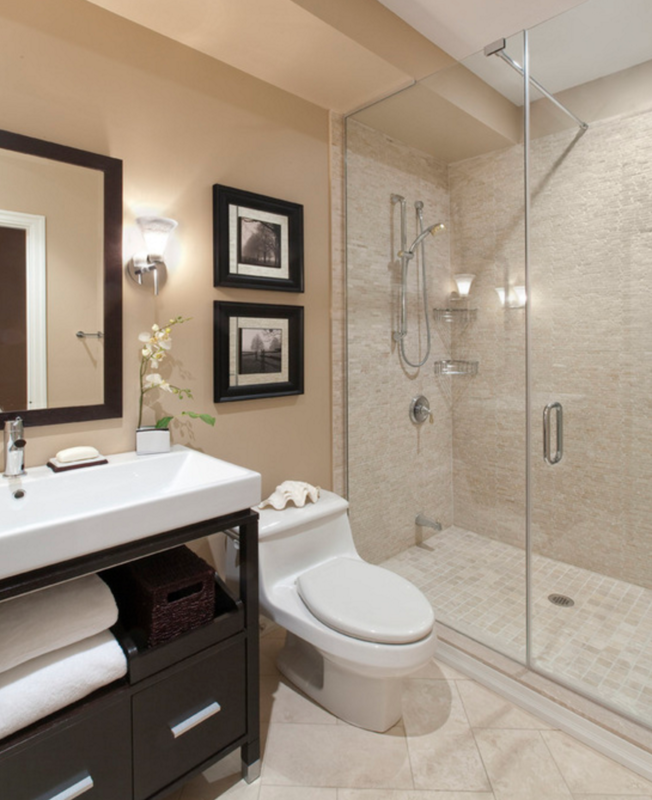 to contractors, selecting cabinets, flooring, tile, fixtures and any other material for your bathroom. 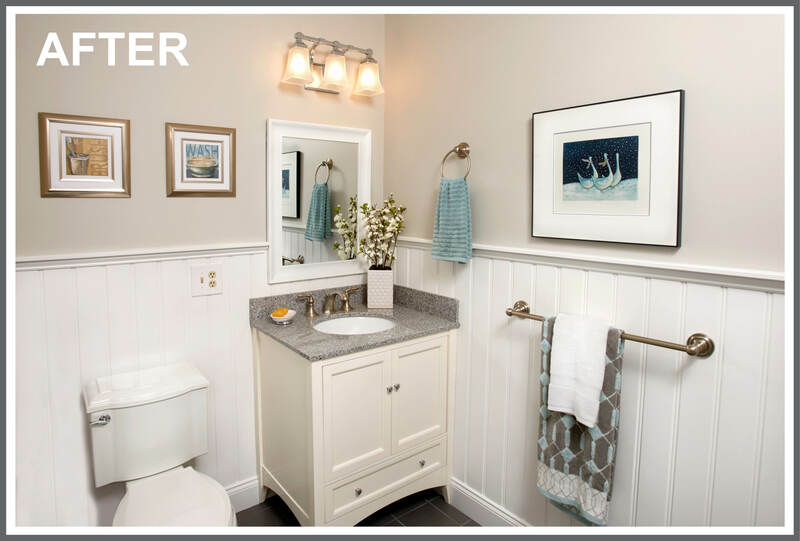 We designed this bathroom around the white vanity & beadboard using neutral gray paint for walls and new fixtures to achieve a Pottery Barn style look. Decide on a color scheme. For vanity – white/linen, darker wood or espresso? Grey cabinets are a current trend but may go out of style in a few years. For walls – neutral or bold tones to contrast or blend? What will your accent color be especially if you are using tile? Try to complement the colors to the adjacent room or hallway. Classic or trendy? If you’re planning to sell in a few years, consider a timeless design otherwise, have fun with something a little unexpected. Replace or refinish? If your budget is limited and cabinets are in good condition, you may opt to refinish or paint them. Either way, there are many price levels for vanity, cabinets and counter top materials to choose from when replacing. Splurge on high end materials or accessories? If tiling walls is not in the budget, accessorize by hanging a beautiful shower curtain that may even get more attention. Better quality fixtures, faucets and vanity hardware are other ways to add a high-end look.